I haven't really read many time travel books but this one was a quite an interesting one to the mix with the potential of being right. Presenting Hourglass #1 Hourglass by Myra McEntire. One hour to rewrite the past . . . For seventeen-year-old Emerson Cole, life is about seeing what isn't there: swooning Southern Belles; soldiers long forgotten; a haunting jazz trio that vanishes in an instant. Plagued by phantoms since her parents' death, she just wants the apparitions to stop so she can be normal. She's tried everything, but the visions keep coming back. So when her well-meaning brother brings in a consultant from a secretive organization called the Hourglass, Emerson's willing to try one last cure. But meeting Michael Weaver may not only change her future, it may change her past. Who is this dark, mysterious, sympathetic guy, barely older than Emerson herself, who seems to believe every crazy word she says? Why does an electric charge seem to run through the room whenever he's around? And why is he so insistent that he needs her help to prevent a death that never should have happened? As I just stated i've not really read many books on time travel and the select few i've read are the potentially incorrect ones... as is the deal for me for having a physics, chemistry, biology background. 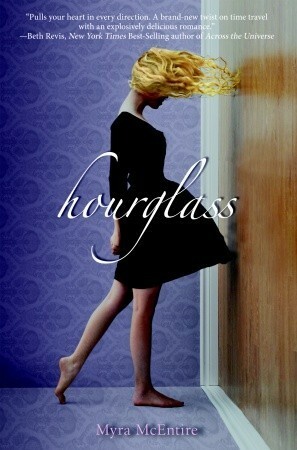 Although, Hourglass has the potential of being scientifically correct but the cover doesn't really do it justice at all. One look at it and my first thought was that this is a contemporary book and not science fiction at all.... so in that sense it looses a point...but regains that due to its one of a kind plot. This is how the story goes like Emerson Cole is a small town Ivy Springs teenager who lives with her famous architect duo brother and sister-in-law Thomas and Dru but there is something different about her. Since her parents have dies in an accident she has been able to see ghosts from the past, not in white or blue (as most portray them) but they appear in full color but transparent. Millions came forward help her but all for naught. This time however the new counselor is different. This one, Michael Weaver, hardly older than her has secrets of his own. Michael may actually hold the answers that Em has been looking for and in her bid to help him may actually find out more about her past, present and her future. Emerson is the protagonist of this tale. She is a modern teenager, independent, beautiful, cautious and a little insecure in herself. She is far from perfect and does not like to ask help and that is perfectly acceptable, it adds to her dynamic character. The addition of Michael adds a new spice to her life. Michael is every bit of a mystery to her. It definitely bodes well to get someone closer to her in age. Along the way Michael and her seem to have developed this strong connection to each other - like two halves of a soul - true soul mates - a love at first sight. The sexual tension is specially unbearable to read about. The romance between these two and all the interactions and passion on display makes this an intense read. And the surprise love triangle with the entry of Michael's best friend, the player and the flirt, Kaleb is a wonderful addition, not that I like love triangles but it actually makes Emerson think about her thoughts on Michael and makes her act on it before disaster strikes because she knows Michael being the gentleman would never act on it. Hourglass on the whole us an interesting and an engrossing read. First in the trilogy, it lays a perfect ground work for it series. But got to give it to the author though she did not overload us with the physics of time in this book, instead of choosing to keep it minimal and focusing on the background and on to Emerson and Michael's story instead. The writing was very good..making me stick to it and finish it in one sitting. The climax was another thing altogether, very exhilarating and action-packaged and emotional, Ms. McEntire gives our favorite couple and that is what really matters. So excited for the next book, Timepiece. "Myra McEtire's Hourglass gives time travel a new dimension all together"
I'm not a big sci fi fan but I love the title and cover of this book! Great review! I totally agree about Kaleb being a wonderful addition. I love him! I'm really getting into his story now. :) Thanks for sharing! Great review. I just read this book, the cover sucked me in, and I was really impressed. I'm not a big fan of love triangles either, although this was more of a love square, but I really liked Kaleb.